Relax and take in the breathtaking views of Mpumalanga’s mountains and the picturesque Lake Longmere at the Pine Lake Resort. The stunning scenery and holiday feel at Pine Lake Resort makes it easy to take a break from daily routines. From the moment you arrive, you’ll feel yourself beginning to unwind. 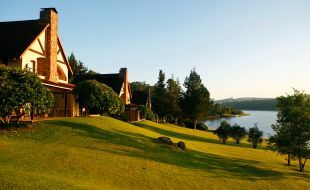 Pine Lake Resort offers 34 self-catering chalets that can sleep up to six people. Each chalet has a living area and kitchen. Attesting to the laid-back atmosphere of this resort, the chalets are equipped with a braai on the patio and a fireplace inside. Amenities and services are provided throughout the resort, including great leisure facilities such as tennis and volleyball courts, a spa, a sauna and canoeing on the lake. The province of Mpumalanga has been storied for its natural beauty and heritage, making it a province that is easy to fall in love with and perfect for a holiday escape. Settled in the beautiful Crocodile River Valley is the farming town of White River. Though trendy and modern, this town holds firmly to its small town charm and farming traditions. White River has become a favourite amongst locals and visitors for its natural beauty – the stunning valley that it lies in, the three irrigation dams and the surrounding forests. The world-famous Kruger National Park is an easy drive from this quaint town, making it an ideal base from which to explore African wildlife – and get your chance to see the Big Five. White River inspires and refreshes; pay it a visit and write your own story of Mpumalanga’s natural beauty. Popular with tourists from around the world, this park is a must-visit. Relax and witness the unforgettable beauty of African wildlife. It is just over half an hour away from White River. Only 35 kilometres from White River, the Sudwala Caves are a deep system of caverns lying in the Mpumalanga region of the Drakensberg escarpment. Here you will have the special opportunity to enjoy a tour through some of the oldest caves in the world. Once a month - the last Saturday of the month - they offer something very special and challenging - the 5-hour long Crystal Tour, where you will get to crawl through mud, water and tunnels to get to a spectacular layer of crystals. This interesting lifestyle centre is just outside of White River. Against the backdrop of mango plantations and beautifully manicured gardens, you will experience a feast for your senses and taste buds. Here you will enjoy exploring quirky, independent shops, the Vintage Car Museum, the White River Art Gallery and culinary treats. This centre also boasts award winning artists from all over South Africa.